Texas Heat - Cajun Pepper Sauce. 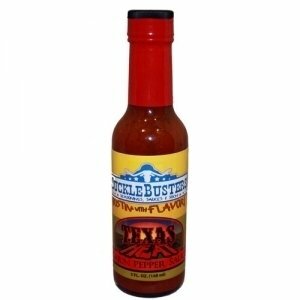 This is a great hot sauce plus it has nice Cajun flavor too! We add thyme, bay leaf, oregano and white pepper to our original blend to kick it up a notch for our next door neighbor. If you are looking to add a hot, Louisiana flavor to your food, this is it. Texas Heat is a fiery blend that hits you like a sweltering breeze and settles in for a long slow burn. And just like a Texas summer - It's Oppressive! Try our Cajun flavor, medium heat index. Ingredients: Chile Peppers, Water, Vinegar, Salt, Sugar, Onion, Garlic, Thyme, Bay Leaf, White Pepper, Oregano, Spices and Xanthan Gum. NO MSG. Naturally Gluten Free.